Many of us love nothing more than a salty snack to curb our cravings. For others the thought of sitting down to dinner without the salt shaker is unbelievable but this salt obsessed nation of ours is doing little to help our health. The side effects of too much salt in our diet have various consequences ranging from mild to life threatening. 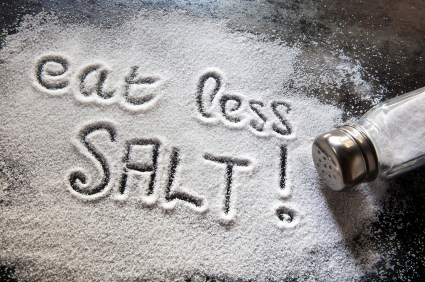 Too much salt can cause our bodies to retain excess water. This can cause that uncomfortable bloated feeling, making us feel sluggish. Retaining water can also lead to disappointment when we step on the scales. After a week of carefully sticking to our diet, we step on the scales only to see that we have actually gained weight. Our bodies can retain several pounds of excess water, purely from a diet too high in salt. However, water retention is the least of our problems compared to the other side effects of too much salt. A high salt intake is strongly linked to high blood pressure which in turn is a major contributor of heart disease and stroke. Too much salt is also widely believed to be linked to osteoporosis, kidney disease, obesity and kidney stones while exacerbating the symptoms of Diabetes, Asthma and Alzheimer’s disease. Something to think about the next time you reach for the salt shaker. The maximum recommended daily salt intake for an adult is 6g, but in our processed, fast food obsessed culture the reality is, most people are consuming far more than this. The average salt intake in the UK is 8.6g. People are unknowingly consuming dangerously high levels of salt as three quarters of the salt we eat is already in the food we buy. The National Diet and Nutrition Survey found that bread was the highest contributor to salt intake at 17%. This is a worrying statistic as bread is not a food most people would associate as being high in salt. · Use salt sparingly during cooking. · Don’t put the salt shaker on the table. · Use herbs and spices to add flavour. · Look out for reduced salt products. · Look at the nutritional information on packets for the salt content before you buy them. · Cut down on the amount of processed foods you consumes such as packet soups, sauces and ready meals. · Cut down on the amount of takeaways and fast food that you consume. · Cut down on salty snacks like crisps and salted nuts. · Remember the maximum recommended intake for salt is 6g a day.